Epicenter Press (WA), 9781935347194, 237pp. Howard Weaver advanced from foot soldier to field marshal in the Alaska Newspaper War, but he never left the fight. He spent time with small-town hoodlums and big-time politicians, crossed swords with Big Oil and Big Labor, and edited the Anchorage Daily News to the most unlikely David and Goliath upset in American journalism history and helped his newspaper win two Pulitzer Prizes along the way. Weaver cared passionately and fought fiercely in every political struggle of his era, from oil development to Native sovereignty, from park land designations to environmental activism. The Anchorage Daily News pulled no punches in telling Alaska's story, and Weaver has pulled none in this account of a fierce, take-no-prisoners battle to the death between his newspaper and the Anchorage Times. Howard Weaver lives with his wife Barbara Hodgin in the Sierra foothills, where they tend about 100 fruit and olive trees and learn, the hard way, about farming. For more information, visit www.HowardWeaver.com. "This book is fascinating, inspiring, and moving. The author tells an important story about the conflicting forces at play in Alaska much larger than his own." "Write Hard, Die Free reads like an X-ray of someone wiht an oversized heart. This is about the battle between good and evil, yet the most stunning portrait is of Howard Weaver - his capacity to care, to fight for things worth fighting for." "The last great newspaper book - a testament to the true value of news and caring about where we live. 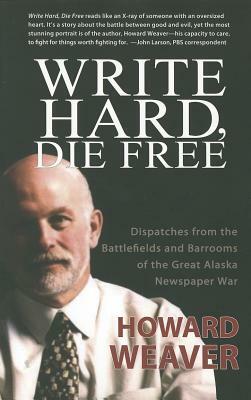 Howard Weaver is a gifted storyteller with amazing tales of fighting for the heart and soul of Alaska." ----Jeff Jarvis, author of What Would Google Do?